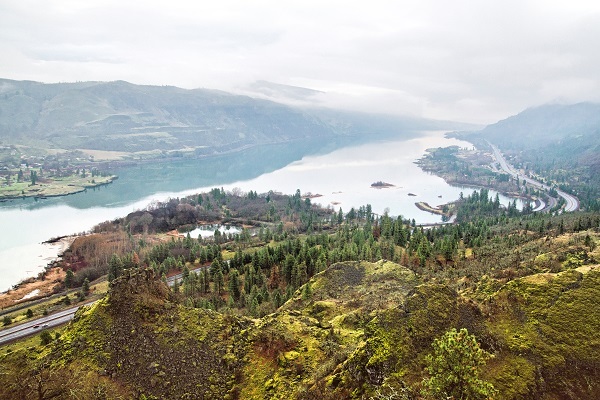 For millenia, the shoreline of this picturesque bend in the Columbia River—80 miles east of Portland and the Eastern Oregon gateway to the Columbia Gorge—has been where hard work happens. This is The Dalles. 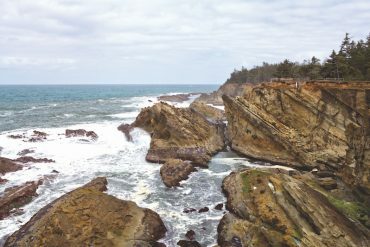 The stretch was a bustling tribal trading and fishing outpost for an astonishing 10,000 years, according to historians. Since white settlers arrived through the Oregon Trail, it has been an industrial hub for farming and food processing, fishing, forestry, hydropower and aluminum smelting (the latter flourished until the early 2000s). Today, The Dalles is still about business. The hulking local dam and its hydroelectric turbines mark the eastern edge of town. Columbia Gorge Community College propels the region’s burgeoning wind power sector. Cherry orchards and vineyards climb the hillsides nearby. The industrial zoned riverfront includes a Google data storage facility. 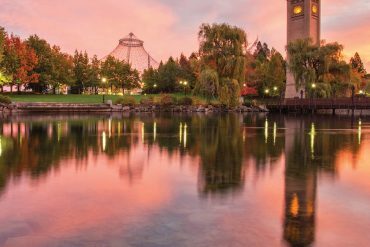 Veer off Interstate 84, which cuts through the heart of town, and you’ll discover the working class city is developing something new—a bit of a tourist cache. On Sixth Street, the ovens glow at a glassblowing studio. The former Carnegie Library houses art exhibits. A French bakery beckons on Second Street. History buffs and riverboat cruise passengers admire murals in the 1860s-era downtown, and neon-clad bicyclists ply the Historic Columbia River Highway. The former courthouse serves up brews and cheese-filled pretzels. This city also has one more thing going for it—the place is like a painting. Renowned for 300 annual days of blue sky, the city sits cradled by angular cliffs and sloping grassy hillsides. In the spring, earth tones and grasslands explode as a palette for multicolored wildflowers. French impressionist Pierre-Auguste Renoir remarked once that, “I like pictures that make me want to walk around inside them.” In The Dalles, you can. Between Hood River and The Dalles, a distance of a mere seventeen miles, Oregon dries out. The landscape goes from tree-filled rainforest to a mix of prairie, draws and rocky outcroppings. For roughly every mile between the cities, there is an inch less of annual rainfall. In life, it’s a good idea to see what you are getting yourself into. That advice will pay off with sweeping vistas on an easy two-and-ahalf- mile hike to the Rowena Plateau, just west of The Dalles. 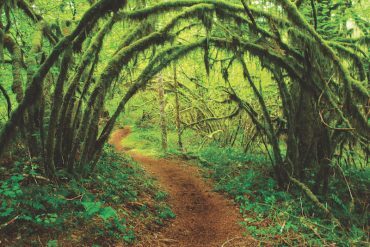 From May to October, the same trailhead offers access to the Nature Conservancy’s 271-acre Tom McCall Preserve. Remember to bring a camera. In spring, your trek will be in Technicolor. At the next exit, the architecturally stunning Columbia Gorge Discovery Center offers interpretive displays and a crash course in the region’s volatile geologic and human history. 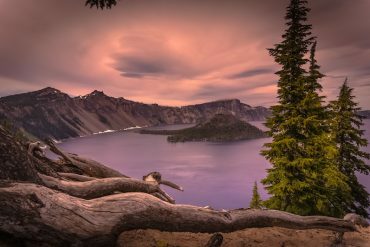 You’ll learn The Dalles was a fork in the Oregon Trail, where families chose between floating the dangerous Columbia or taking the treacherous Barlow route across Mount Hood. Your next choice is decidedly more fun: Facial? Hydrotherapy? Massage? You’ll find any or all of them at Water’s Edge wellness center and spa, one of the only local places to relax on the banks of the river. At Cousins’ Country Inn, don’t be freaked by the faux farm animals. The Western theme is homey, and deluxe rooms in their barn building tout fireplaces and giant showers with multiple sprayers. They say the pillows are great. You’ll figure that out if you ever exit the shower. The local $5 Taxi will whisk you to the Baldwin Saloon, a brick, high-ceilinged building that first opened in 1876. In its existence, the building also housed a steamboat navigation office, brothel and coffin storage warehouse. It reopened as a restaurant in 1991. The menu is expansive. Try the scallops or the light and lemony chicken scallopini. The chocolate mousse vies to be as dreamy as your pillow. Like she’s done for twenty-three years, Caroline Homer plays old-style piano on Fridays and Saturdays—except during elk season. Then, she’s gone hunting. Like to start your day with a jog? 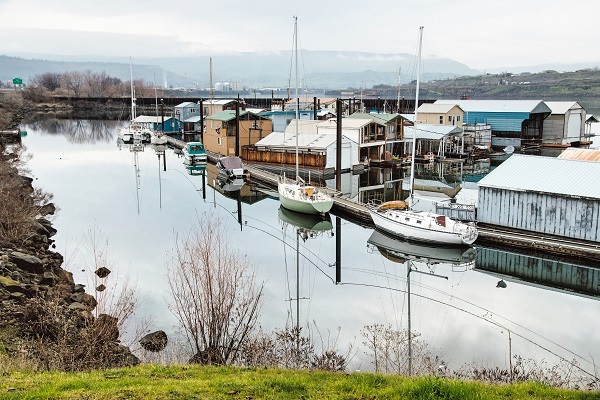 The city’s asphalt riverfront pedestrian path snakes past industrial sites, a cherry processing plant, the local marina and rock fort, a basaltcircled campsite used by the Lewis and Clark Expedition in 1805. The spot was selected because of fears natives might be plotting something nefarious. Fortunately for Lewis and Clark, American Indians didn’t banish them to a reservation or anything, and the expedition continued downriver a few days later. Downtown, inspect a mural or two and satisfy your cravings for coffee and chocolate croissants at Petite Provence of the Gorge, the only eastern outpost for a Portland-based French bakery. The breakfast menu includes, not surprisingly, french toast. A block away, you can literarily get lost in Oregon’s oldest bookstore, Klindt’s Booksellers, circa 1870, where stacks line both walls and the center of the wood-floored retailer boasts whimsical gifts such as Edgar Allen Poe-purri air freshener and a Sasquatch field guide. Cyclists can try a smorgasbord of local scenic routes, from jaunts through cherry orchards to longer-distance pedals through rolling wheat fields. Get directions and comfy bike seats at Dalles City Cyclery. 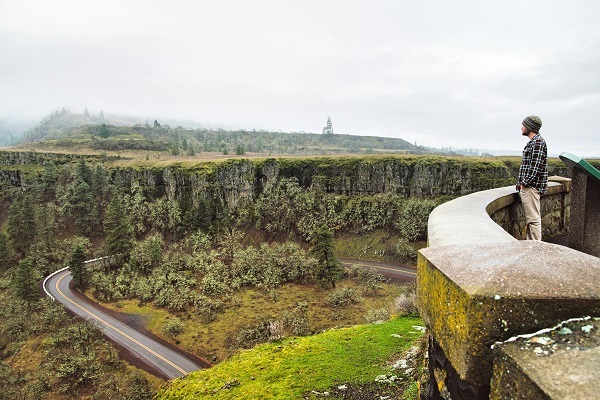 For a stress-free ride, try the historic Columbia River Highway from Mosier toward Hood River. The five-mile stretch is closed to cars, and passes through several climate zones and the renowned Mosier Twin Tunnels. Parking at the Mark O. Hatfield trailhead in Mosier is $5. Grain towers that loom over the east end of downtown once milled wheat for Sunshine brands’ Cheez-It crackers. Today the place is home to the Sunshine Mill Artisan Plaza and Winery, with red-and-gold-painted metalwork and a tasty white blend dubbed Nirvana. 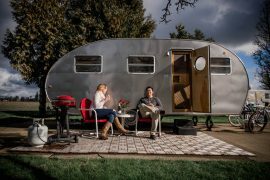 The owners are former cherry growers and entrepreneurs whose products include Copa DiVino, single-serving wine cups that now retail in more than forty states. Outside when the weather is warm, toss bocce balls and catch movies projected onto the silos. A block away, locals rave about Tijuana Mexican Restaurant. 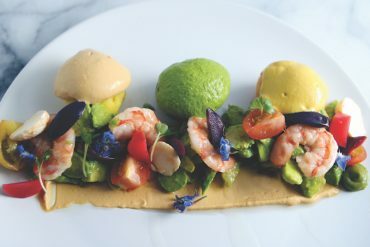 Whet your palate with a huckleberry margarita, then move on to the shrimp ceviche tostada, puerco asada with guacamole and anything with their rich mole sauce. Really, anything. Cap the evening with drinks and maybe pinball at Clock Tower Ales, set at the former Wasco County Courthouse. 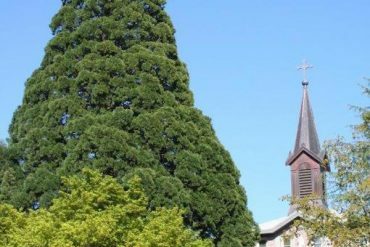 It was built in 1883 and is the site of Oregon’s last public hanging in 1905. 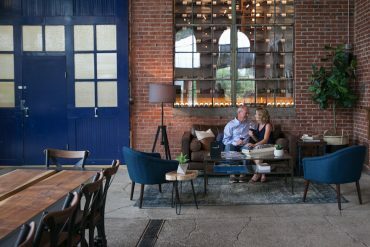 With the lively patio, a full bar and thirty drinks on tap, it’s a cooler place nowadays to hang. Fair warning, the door chime at Cousins Country Restaurant makes barn animal sounds, and the staff will call you “cousin.” A lot. Comfort food is what Cousins does best. As the menu declares: “Everything is even better with gravy.” Truer words have never been spoken. When The Dalles Dam was completed in 1957, the rising river covered one of the most significant places to American Indian tribes: the fishing grounds at thundering Wyam Falls, also known as Celilo. The current water at grassy Celilo Park, just east of The Dalles on Interstate 84, shows barely a ripple. Today, the nonprofit Confluence Project is working to erect a piece of public artwork at the park. Maya Lin, who also created the U.S. Vietnam War Memorial, envisions an arcing elevated walkway extended over the water, evoking memories of the fishing platforms once here. 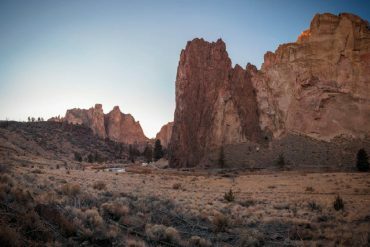 A few miles farther east is the mouth of the Deschutes River, where trails beckon and the water is home to big fish. After working up an appetite, head to the farm town of Dufur, just south of The Dalles in wheat and cattle country. Here, you’ll find Kramer’s Market, where they grind local meat daily for flavorful burgers and you can grab your own drinks from the old-style fridge. Back in The Dalles, there’s still time to fling Frisbees at the golf course at scenic Sorosis Park, adjacent to the community college. If it’s cherry season, don’t forget to find a fruit stand or pluck some at a U-pick farm. 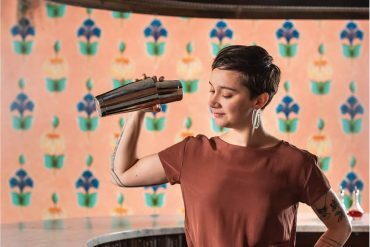 For your final stop, your taste buds will thank you at the Chocolate Lab, home to artisan chocolate and silky lavender-infused caramel. Amazing enough, as Renoir would say, to stroll in it. 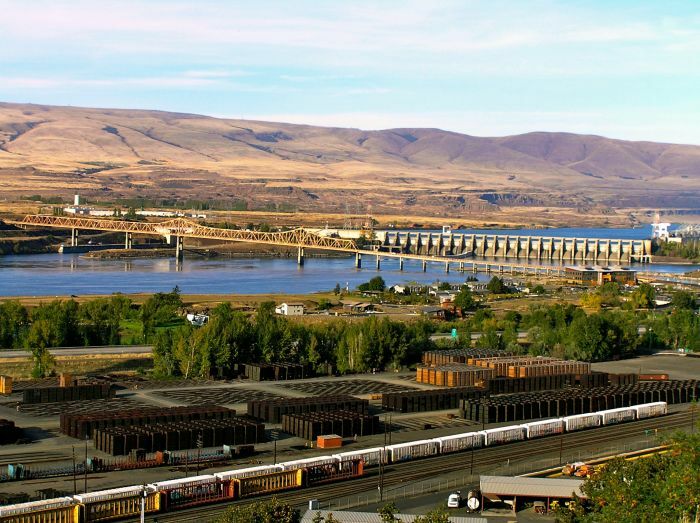 The Dalles has a big problem – it isn't Hood River. Is this really a problem? Only for those who can't get their head wrapped around what is great about the Dalles without smearing Hood River (like this author). Hood River gets annually an average of 30" of rain. A rain forest gets 98-177. 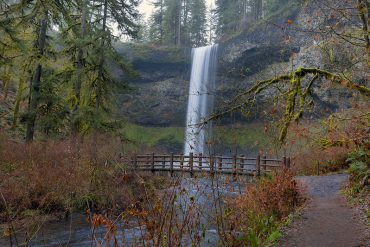 There are a few places in the gorge that get "rain forest" levels of rain, but not many. Cascade Locks gets 77" of rain on average – way below rain forest. Cascade Locks is 20 miles from Hood River. That's almost a loss of 50 inches of rain in 20 miles. Oh, my. 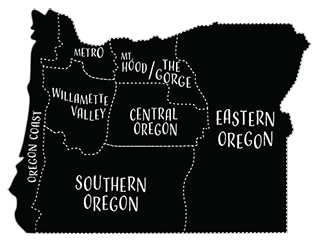 Get over it – The Dalles is not Hood River. Hood River is wetter but certainly nowhere even near rain forest. The Dalles is a wonderful town all on its own – not because it's not Hood River – because it is historical, beautiful, interesting, special The Dalles. Wow! Absolutely compelling and honest commentary on this secret paradise. I have an auto-immune disease, live in Portland currently. I plan on relocating to the Dalles for my health. The dryer climate is much healthier for me and I feel GOOD when I am there. Added footnote, I grew up in Hood River, but the Dalles' milder climate works well for me. I moved here 37 years ago & absolutely love it here. Even though I have traveled abroad, I still find The Dalles, one of the most beautiful & intresting places, I have ever been. The people here are friendly & down to earth kind of people.It is a great place to raise a family, & a great place to come home to!